Following the tradition of great coming of age movies of the ’80s and ’90s, Greta Gerwig’s directorial debut Lady Bird is a masterclass in nuance. Taking some of the sub-genre’s most well worn character and story tropes – the overbearing mother, misguided teenage romance – Gerwig subtly re-imagines and updates them, adding complexity and layers, reflecting the film’s early 2000s setting. In doing so, the actor turned filmmaker has crafted what many are labelling the definitive coming of age story for the millennial generation. Earning critical acclaim and doing great business at the box office already, while building more and more Oscar buzz as the days pass by, the audiences, critics and industry alike are united. Focusing on titular character Lady Bird (Saoirse Ronan) – real name Christine – as she navigates her final year of high school in Sacramento California, the film is a not only a portrait of its protagonist, but a study in how she is formed. An amazing set of supporting characters round out the details of this picture, with standout performances from Laurie Metcalfe as her well meaning but habitually critical mother and Beanie Feldstein as her long suffering best friend Julie. Invigorated by Gerwig’s sharp writing and thoroughly spoken sounding dialogue, the film is an ensemble piece that manages to become something more than just the sum of its parts. Transcending its influences yet paying homage to tradition, the film tells a timeless story through its authentic portrayal of growing up in the new millennium. So join us as we unpack all the reasons why Lady Bird is the definitive coming of age story for millennials. Parents of young teens, take note. 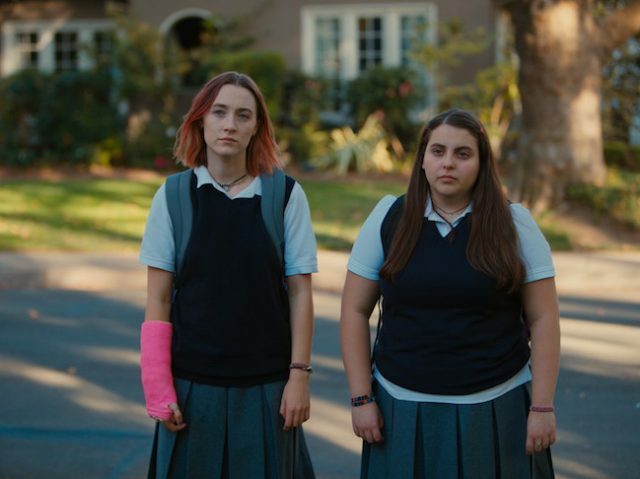 The first thing that makes Lady Bird so ‘millennial’ (that’s right it’s an adjective now) is the fact it is clearly and authentically set in 2002 – a time when The Dave Matthews Band was cool and Alanis Morissette was briefly considered radio friendly. Hardly the first film to take the early 2000s for its setting, it however feels like the first film to be made by someone who grew up in the period – which coincidentally it was – with details such as musical cues and fashion perfectly balancing familiarity with idiosyncrasy. The result is a very personal nostalgia, and a sense that this is Gerwig’s 2002 and not just collection of cultural highlights sandwiched into the story to make us feel something. When was the last time you saw a film aimed at teenagers opening with a reference to John Steinbeck? Well Lady Bird does and it somewhat sets the tone for the rest of the film. Gerwig clearly delights in giving little nods here and there to literary or artistic figures such as Stephen Sondheim and Howard Zinn, but just as with the film’s 2002 setting, she exercises restraint, ensuring each allusion serves a purpose. 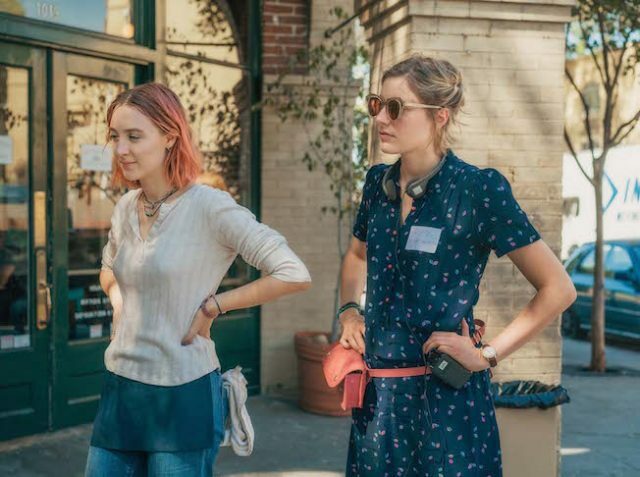 Gerwig proves herself a master at revealing and building character through such details, whether it is showing us how Lady Bird and Marion’s similarities set them at odds with each other – opening with the pair crying together as they listen to The Grapes Of Wrath only to break out in an argument – or just a subtle bit of character building as in the case of pretentious Kyle’s (Timothée Chalamet) love of Zinn. And hey, what is more millennial than making obscure intellectual references to your cultural heroes central to understanding the inner lives of your characters? While it is impossible to pick a standout performance from the film, Laurie Metcalfe’s turn as Lady Bird’s mother Marion is certainly a stand out of the actor’s career. What gives the performance so much life is once again Gerwig’s script, with Marion fully realised as a person between the lines and before our eyes yet perhaps not always in the actual words she speaks to Lady Bird. This fusion of emotional inarticulacy and dramatic irony makes Marion one of the film’s most powerful characters. Most importantly though it stops her from becoming a stereotypical evil parent while still allowing us to empathise with Lady Bird’s adolescent rebellion. The film is full of moments where you feel for both women that they have to put up with each other. Part of what has made the film so effective has been Gerwig’s impressive ability to drew new insights from familiar material. Cliche is especially problematic when working in a sub-genre like the coming of age tale. Too much and nothing rings true, and not enough can leads to a confused audience unable to relate to the material. Lady Bird however strikes the perfect balance, the story and characters feeling familiar enough that you know where the story is going, yet changes enough so that you always find yourself somewhere unexpected. And while there are countless examples to choose from, personally the re-configuring of the traditional bad boy into the brooding musician with literary delusions that is Kyle is the winner in terms of millennial-ness. One of the most refreshing aspects of the film is that rather than focusing on an underdog overcoming insurmountable adversity, it showcases the strength it takes to get through everyday life. Not to discount the obstacles faced by Lady Bird in the film, but they could rather un-flatteringly be described as first world problems. Rather than dismiss them as such however, Lady Bird takes the time to unpack them and explore them showing us that no problem, no matter how trivial, is simple for the person experiencing it. One of the major pitfalls that comes with exploring the difficulties of teenagers coming of age is that they can come off whining in-grateful brats if not written well. Luckily Lady Bird has good writing in spades, with Gerwig proving herself a master of writing dialogue that sounds like people actually speak. This pays massive dividends throughout the film, but especially when Lady Bird is arguing with her mother. In exchanges that run the risk of dropping into cliched bickering, Gerwig is always careful to make sure that Lady Bird is always arguing for something she has chosen or wants for herself and not just arguing for arguing’s sake. The pacing of the film is one of the most paradoxically effective parts. Rather than run headlong toward the closing credits, Lady Bird takes its time with its characters allowing scenes moments of silence and, in general, letting the emotions of each scene play out in full. Yet at the same time it condenses a entire year of our protagonist’s life down to just over 90 minutes, all while never feeling rushed. If this isn’t a millennial-esque feat of time management I don’t know what is. As we all know, trying/failing to find all the answers to life if a big part of coming of age, and a big part of Lady Bird. This is yet another trope of the coming of age tale, and in characteristic fashion the film chooses to eschew the stereotype, replacing trite simplicity of John Hughes or the hyper-sexualised nihilism of Todd Phillips with a complex truth. No one is right. No one on the film has the right answer, not even Lady Bird. If anything, this could be said to be the film’s central premise, that we’re all wrong but that it doesn’t matter, it’s how we treat each other that matters. Which, looking back at 2002 from 2018, sure seems like a lesson we could do with learning again. This should come as no surprise to anyone who keeps track of film media. I’ve already ranted about how amazing Laurie Metcalfe is – and she is amazing – so let me take this chance to really celebrate Ronan’s work as Lady Bird. She disappears into the role and I had to remind myself numerous time that the she didn’t write the film. There isn’t a moment in the entire movie where I felt I was watching someone act. In particular, the scenes of her and her best friend Julie just hanging out and laughing are, despite the simplicity of it all, some of the most affecting movie scenes of recent memory. Timothée Chalamet as sardonic muso bad boy Kyle is also lots of fun, while Tracey Lett’s turn as Lady Bird’s troubled father Gary gives us a more tragic side of masculinity. What could be the most inspiring aspect of the film however is that, at it’s core, it is about people growing by accepting their flaws, rather than controlling or suppressing them. This may be hard to draw out of the film’s action however, as it isn’t until the film’s final moments that this becomes apparent. Having finally made it out East, going to college in the big apple where she always dreamed and experiencing all the up and downs of the student lifestyle in such a bustling metropolis, this moment is a sign that our Lady Bird has finally accepted herself as her mother’s daughter, and not her mother’s prisoner. It’s a wonderful moment of parental connection. ‘Lady Bird’ is in cinemas now.